Proven security combining speed, accuracy and minimal system impact. Eliminates all types of threats including viruses, rootkits, worms and spyware. Provides real-time on-access scanning of the server-stored data. Powered by the advanced ESET LiveGrid® technology combining speed, accuracy and minimal system impact. Delivers proven protection while leaving more system resources for the server’s vital tasks. 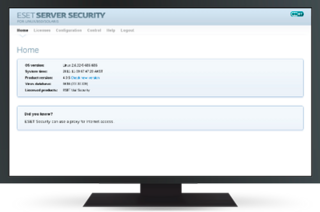 Compatible with ESET Security Management Center and supports management through a web interface. Gives you the option to schedule on-demand scans, actions and security tasks. Allows you to customize log details and modify reports and notifications to help you monitor compliance with company security standards. ESET provides installers for the most popular distributions of Unix-based systems, including the ‘Ready’ variations of RedHat and SuSE that comply with the File-System-Hierarchy standard. Requires no external libraries except for LIBC. Eliminates malware targeting all platforms, including Windows, Mac and Linux operating systems. Prevents malware from spreading from one platform to another.